Hollyburn Properties is a proud Canadian family-owned and operated company, honoured to support The Royal Canadian Legion during Veterans’ Week each year in our apartments for rent by making poppies available in every building lobby in Vancouver, Calgary, Toronto and Ottawa. The poppy is the official symbol of remembrance, worn to commemorate fallen soldiers around the world. Hollylburn matches all financial contributions from our residents to this important cause, with proceeds supporting veterans across Canada. Veteran’s week 2016 runs from Saturday, November 5th – Remembrance Day, Friday November 11th. This year, spread the message online by using the hashtag #RememberThem to share your support. 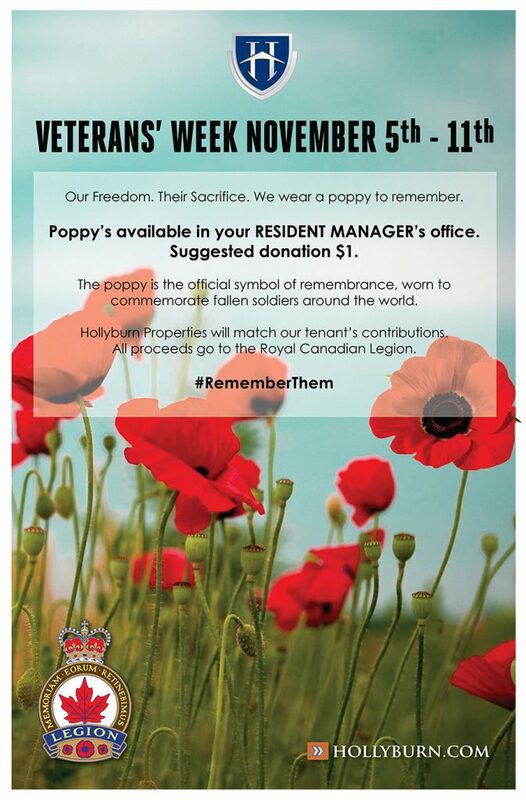 Check your lobby or ask your Resident Manager to purchase a poppy today! Suggested donation is $1.